At Ferrarini and Vismara, tradition and innovation combine to bring the freshness and aroma of our cured meats to your dinner table every day, always providing that freshly-sliced effect. At home we can offer you a wide range of the best Italian cured meats, just like we do at your favourite deli. The freshness of Vismara and Ferrarini cured meats ensure that their goodness is conserved for as long as possible, with cutting-edge technology used to create handy trays designed to preserve the flavour and nutritional value of the product. The new Vismara production facility commenced operations in 2012, just a short distance from the company’s historic Casatenovo headquarters. Our wealth of production experience in packaged sliced meats and our commitment to research and innovation – now supported by the new plant – allow us to generate large production volumes without sacrificing our respect for age-old recipes and processing methods. These are the values that make our products truly special and absolutely unique. Say hello to the Vismara take away range, for a table full of delights.There are countless varieties on offer to suit all palettes – the more demanding among us included – and all occasions. Try the Vismarissima Mortadella, High Quality Cooked Ham, aged Cured Ham and a whole range of other delicacies. All Vismara take away products are produced without the addition of milk protein, lactose or sources of gluten, making them ideal for a healthy, balanced diet. Indulge your creative side in the kitchen with Coriandoli cooked ham and bacon. The unmistakeable taste of Vismara ham and bacon is now available in a new cube format under the name Coriandoli in practical, dividable packs. Add flavour and colour to your dishes, with no gluten, added milk protein or lactose. You simply have to try them! 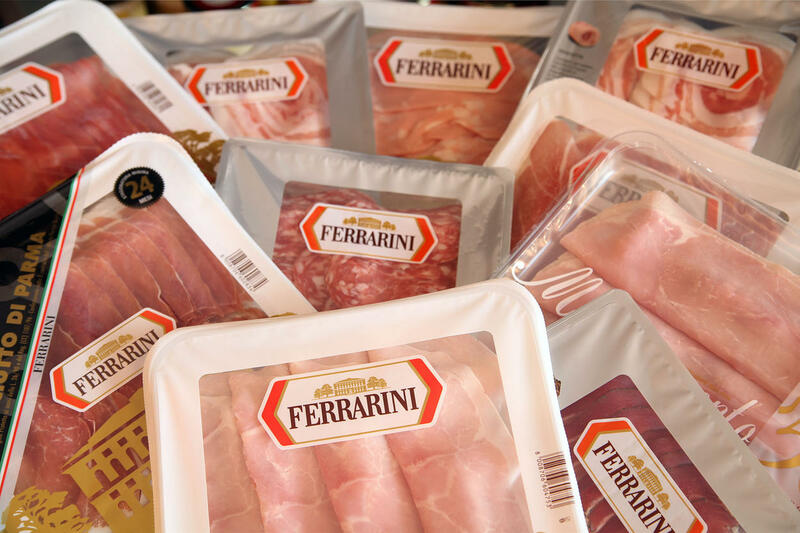 We offer a wide assortment of delicious Ferrarini sliced meats in handy trays, encompassing the best of Italian cured meat production. What’s more, the technology used in the manufacturing of the packaging keeps the contents tasting as if they were sliced just seconds beforehand. All the goodness of Ferrarini cured meats in a practical tray, perfect for taking straight to the dinner table. We recommend that you open the pack ten minutes before consuming sliced Ferrarini and Vismara products… you’ll love the aroma! Can Coeliacs and people who are lactose intolerant enjoy these products? All Ferrarini and Vismara cured meats are free from gluten, milk protein and lactose. What should I do if I find mould in the packet? Mould can only develop if the packaging is damaged, allowing air to enter. Indeed, the presence of oxygen is an indispensable condition for the development of mould. The thousands of packets we produce on a daily basis are subjected to numerous checks and inspections before delivery. Damage may occur after delivery to our clients or when on display, due to incorrect handling and/or accidental damage. Modified-atmosphere packaging is a system that substitutes regular air for a blend of gases that increases the shelf life of our cured meats whilst conserving their traditional, freshly-cut taste.